Dave Grohl has had a wild start to 2019, much of it spent paying respect to the hard-rock and metal gods. First, he and the Foo Fighters performed at January’s massive all-star concert I Am the Highway: A Tribute to Chris Cornell. Later that same month, Grohl took up his guitar at this year’s edition of the annual Dimebash, to hail late, great Pantera guitarist Dimebag Darrell, as well as to personally man the grill and cook up some BBQ for attendees. Then, this weekend, the Foos played DIRECTV’s big “Super Saturday Night” show with incendiary hip-hop duo Run the Jewels in Atlanta, Georgia, the day before the Super Bowl, and they brought out some famous friends for some badass cover songs over the course of the evening. 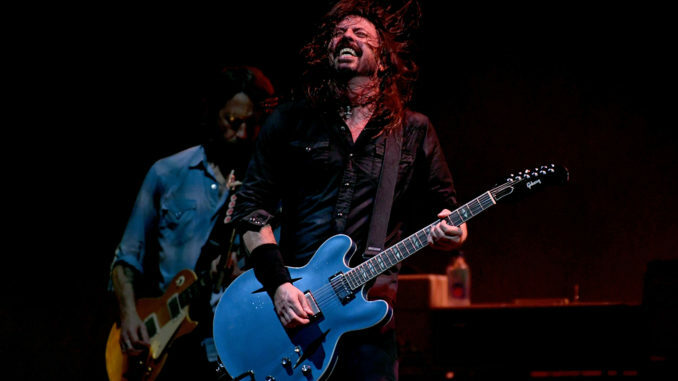 Grohl and Brown traded off on vocals, with the latter unleashing a particularly impressive Ozzy-esque howl, while Morello ripped out a characteristically nuclear guitar solo. Check out fan-shot footage below. This isn’t the first time even this year that Grohl and Brown teamed up for a killer heavy-metal cover — on January 31st, the head Foo Fighter joined the Zac Brown Band at the Pandora Live Superbowl 2019 event to sing Metallica’s “Enter Sandman” in a reverent yet somewhat revisionist rendition complete with hand-clapping and fiddle playing. You can see fan-shot video of that performance below, as well.